GATE 2019 CSE Syllabus: The Graduate Aptitude Test in Engineering 2019 will be conducted in the month of Jan/Feb. The aspirants who are going to appear in that exam, they will require the GATE Syllabus for Computer Science Pdf. The syllabus plays a key role in the preparation of an exam. The aspirants can also check the GATE Exam Pattern for Computer Science. With the help of exam pattern, they can get an idea about the weightage and difficulty for the paper. They can prepare for the exam according to the GATE 2019 Exam Pattern for Computer Science and will be able to score high in the GATE exam. 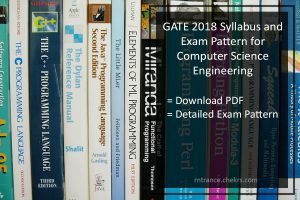 The aspirants can check and download the GATE Syllabus for Computer Science given below in the article. They can prepare for the exam according to the topics from which the questions will be asked in the exam. The GATE Syllabus for Computer Engineering is divided into three parts first is General aptitude, second is engineering mathematics and the last one is Computer Science Core subjects. The aspirants who are preparing for the GATE 2019 Exam they can check the GATE Exam Pattern for CSE given below in the article. With the help of the GATE Computer Science Exam Pattern, the aspirants can get an estimate of the number of questions, weightage of questions and the duration of the exam. They will be able to prepare for the exam according to the exam pattern so that they can get a lower rank. The GATE 2019 exam will be of 100 marks. The total 65 questions will be asked in the exam. 10 questions will be asked from general aptitude section and other from the mathematics and core subjects. Here we have mentioned GATE CSE Syllabus with Weightage. The aspirants can download the GATE 2019 CSE Syllabus by clicking on the links given below. The syllabus for GATE is detailed topic wise. All the chapters are divided into heading and subheadings. Aspirants are advised to prepare according to the exam syllabus if they want to crack the GATE 2019 Exam. For more queries and feedback regarding GATE Syllabus and Exam Pattern for Computer Science, you can contact us by commenting in the comment section given below.